CTU educators at 10-23-18 CICS board meeting. CICS teachers to rally, then vote on strike against charter operator in battle for more classroom resources, better wages and working conditions. 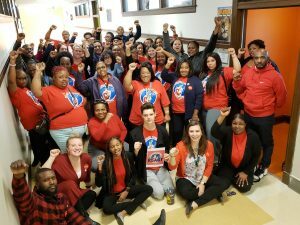 CHICAGO—Fed up with low pay, high turnover, huge workloads and out-of-control management salaries and fees, CTU educators at four Chicago International Charter School (CICS) schools will take a strike vote Friday in their escalating battle for better working conditions for educators and better learning conditions for their students. 6:30 a.m.—CTU Vice President Stacy Davis Gates and other officers, joined by CICS teachers, will be available for media interviews. Full staffing, including more staff for special ed students, and smaller class sizes. CICS wants to increase class size to 32, and at one school is using paraprofessionals instead of teachers to teach classes. A contract provision that requires CICS to follow all federal and state special education laws—a demand that CICS management has rejected. One contract for all four schools that includes fair compensation and benefits, including quality health insurance, to retain and attract the most experienced educators. Equal pay for equal work. The starting salary at Civitas for a teacher is $44,000/year, more than $8,000 less than at CPS district schools—and a thousand dollars less than the average teacher salary in West Virginia, where the cost of living is much lower than Chicago. Low pay and deep cuts to classroom resources in West Virginia sparked a wave of teacher protests in states across the nation last year. Retention and stability of the paraprofessional workforce by recognizing them as members of the CTU bargaining unit. 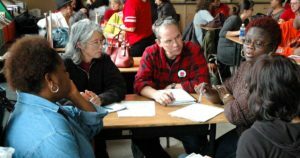 Paraprofessionals have voted overwhelmingly to join the CTU. The charter chain’s refusal to accept provisions that protect students and support teachers is particularly galling given the huge salaries CICS pays its executives—and the astronomical management fees the operator skims from public education dollars. Educators are demanding that those funds go instead into classrooms and student supports. While custodians in the CICS central office earn just $12 an hour, salaries for the charter’s executives total $2.5 million, with the CEO raking in over $230,000, and 13 other executives making over $100,000. Upwards of 29 percent of public school funds that go to the charter holder never make it to the classroom—with CPS taking its own fees in addition, as well. Instead, millions of dollars are siphoned into wasteful layers of management. If teachers approve the strike vote Friday, they will join colleagues at 15 UNO/Acero schools who voted overwhelmingly on Tuesday to strike. Acero and CICS are two of 11 charter operators currently in contract talks with the CTU.